Jan. 24, 2017, 10:32 a.m.
Plus: Panoply grabs some big partners, question marks at Acast, and success in local podcasting through Hearken. By Nicholas Quah Jan. 24, 2017, 10:32 a.m. Welcome to Hot Pod, a newsletter about podcasts. This is issue 104, published January 24, 2017. Panoply signs two more partners for its Megaphone platform: WBUR and BuzzFeed Audio. The company also announced a platform feature called Megalink, which purports to “simplify the podcast subscription process.” The feature doesn’t seem to be anything particularly fancy; from the looks of it, a “Megalink” is a fancy link that simply routes the user to the primary podcast app on that device (that is, the Podcasts app for iPhones, Google Play Music for Android). This isn’t to downplay its potential usefulness, of course — anything that streamlines the flow from discovery to actual listening is a plus. 2. BuzzFeed Audio moving its podcasts to Megaphone should be quite a blow for Acast. The Swedish company had been hosting BuzzFeed’s podcasts since late 2015, and the partnership was widely utilized by the company as a hook for its brand development. (A buzzy partner on a slide deck goes a long way when you’re targeting bigger media organizations, after all.) This news comes shortly after the company’s former chief revenue officer, Sarah van Mosel, announced her departure to advertising sales firm Market Enginuity after only a year at the job. It also comes after what appears to be a steady trickle of notable podcasts moving away from Acast’s platform to competitors, including Call Your Girlfriend (now repped by Midroll and hosted on Art19), Switched On Pop (now with Panoply), and Who? Weekly (now with Headgum, also hosted on Spreaker). Acast’s future, and whether it will stick to its strategy of targeting big-name partners, remains to be seen. In any case, the company seems to be doubling down on the U.S. despite its losses, recently opening an office in Los Angeles. When contacted, a spokesperson simply noted that the company wishes BuzzFeed the best of luck, and that updates on its 2017 strategy are forthcoming. We’ll see how it goes. 3. Regardless of what happens with Acast, it seems like the competition between Panoply’s Megaphone and Art19 is the primary land-grab to watch, with both platforms racking up strong client lists thus far. 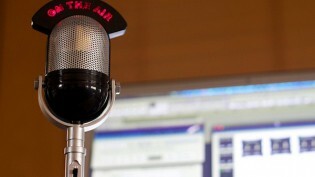 Megaphone still sports Gimlet as a hosting client, and Panoply has largely followed through on its focus to sign, collaborate with, and represent audio programming produced by media companies (like Vox, Politico, and The Wall Street Journal) and authors (like Malcolm Gladwell and Gretchen Rubin). Art19, on the other hand, seems to have built a client list based on a strong coalition of podcast companies — including Midroll Media, Feral Audio, DGital Media, and Wondery — along with big, individual publishers like The New York Times. Which makes sense; podcast networks would likely be wary of establishing a hosting partnership with Panoply, which theoretically competes with them in the advertising marketplace. How Panoply negotiates that awkwardness, and how Art19 capitalizes on it, will be the narrative to watch over time. The Trump administration is considering privatizing the Corporation for Public Broadcasting (CPB), according to a report in The Hill. The writeup also notes plans to eliminate other federal sources of support for the broader public media ecosystem. Really can’t say I’m surprised to hear about this — indeed, in the very first Hot Pod published after November’s elections, I felt it necessary to state that all eyes should be on the CPB, the vessel of federal funding whose operations are essential to the health of the public media system. 1. All three writeups make reference to the historical on-again, off-again tensions between Republican administrations and the public media system’s perceived relationship with liberal ideological bias. Which is useful context, but it also evokes some optimistic suggestion that, despite these conflicts, the public media system has survived to this day, in effect drawing upon the past to inform what might happen in the future. I hold no such optimism. If this election has illustrated anything, it’s that we’re dealing with a dramatically anomalous state of affairs cultivated by an administration that’s unprecedented on numerous levels. It’s also an administration that deeply centralizes the media as a tool of power. The federal investment in public media is vital seed money — especially for stations located in rural America, and those serving underserved populations where the appropriation counts for 40-50% of their budget. The loss of this seed money would have a devastating effect. These stations would have to raise approximately 200 percent more in private donations to replace the federal investment. Which is to say, while bigger stations like WNYC and WBUR might well be able to make up the gap and survive, a good swath of the smaller stations across the country — whose well-being have long been under assault between the economic conditions of their respective locations and some amount of digital disruption — will likely be blown out. The consequence of that would the further debilitation of local, civically-minded news and information infrastructures in places that really need them. Much has already been written about the decline of local newspapers, and one can only imagine that this development, with its focus on the broadcast radio end of the local media spectrum that had been relatively insulated, will further accelerate that decline — and deal yet another harsh blow to the health of civic society. Hearken-powered local podcasts. However the problems of local media will be dealt with at a system-wide level, I nonetheless strongly suspect that the building of tools that encourage a strong sense of community will be a big part of the solution. Some of Hearken’s partners are beginning to see encouraging returns. Brandel tells me that a few partners have told them how Hearken-powered stories are already being cited during membership drives as why people give for the first time, or why they increased their donation level. KQED reports that Bay Curious is seeing listenership grow every week, along with a healthy stream of positive feedback. Lifelong loyalty, indeed. You can learn more about Hearken on their website. Jezebel now has a podcast, the delightfully named Big Time Dicks, which spins out from the site’s Big Time Small-Time Dicks column that keeps a critical eye on politics and policy at the local and federal level. What’s interesting: note the mention of the “Fusion Audio Network” in the iTunes listing — recall that the Gizmodo Media Group is now part of Fusion in its post-Gawker existence — as well as the namedrop of Mandana Mofidi in the announcement post, who serves as the executive producer of audio for the operation. Designing positions for audio producers (for first-timers and instigators). One of the biggest things that animates my optimism in the podcast industry is its potential to open up more substantial work opportunities for audio producers, particularly as more existing media companies and entrepreneurial types get drawn into building whole new ventures and teams around audio programming. That’s the supposed beauty of the Internet’s democratizing force: Where audio programming was previously monopolized by a few who have power over the limited means of distribution — in audio’s case, radio companies and finite broadcast airwaves — greater numbers of new businesses can now be built on top of the infinite horizon of the Internet. And the more businesses that are built, the more producers can get employed. Seems pretty straightforward. Of course, things are never that simple. The quality of the new jobs being created is always a question, and a big part of that has to do with how these new ventures — some of which will come with significant background in radio, some of which come in fresh — understand the role of audio producers and, perhaps more importantly, the work that goes into creating valuable audio products. A breakdown in this key juncture has the potential to trigger a downward spiral; a misunderstanding of a role leads to misunderstood hires leads to poor products leads to failed efforts leads to an entrenched misunderstanding of the original opportunity, after which everybody leaves the arrangement unhappy. All of that was in the back of my mind when I spotted veteran audio editor Julia Barton’s reaction to a recent Washington Post job posting for an audio producer a few weeks ago. “Biting my tongue,” she wrote on Facebook, in response to the job description. Barton has been quite vocal in the past about how the work of audio producers are often underestimated. Most recently, she wrote an article for Current where she argued that the widespread use of generic stock mic photos in writeups about audio work reflects and abets a harmful oversimplification of the job. The premise of Barton’s argument might be somewhat mischievous, but the underlying impulse that energizes the piece — that cultural representation has material consequences — is nonetheless important. Curious, I reached out to Barton to talk more about the thinking behind her reaction. Quah: What, exactly, was it about the job posting that you were responding to? Barton: This is not to drag The Washington Post — I’m thrilled that they’re looking to hire so much talent and expand. I came across this particular audio-producer listing because a WP staffer posted on Twitter about video hiring, and I was curious if they were hiring in audio as well. That tells me (again, I hope I’m wrong!) this is a shop that views podcast production as a one-man-band effort. It carries the assumption that podcasts are easily knocked off, one after another, with a little prep, a recording session, and a couple of hours in front of an audio-editing suite. And that’s just not how it works if your goal is “rich audio storytelling.” People seem to get that it takes a village to run a newsroom or to make a broadcast or produce a studio album, but the fantasy persists that audio storytelling is simple and cheap. That’s just not true. Nicholas Quah: Could you broadly walk me through the job of the producer? Julia Barton: It really depends on the project. If you’re a daily broadcast newsmagazine like All Things Considered or PRI’s The World, and you have to fill a fixed clock? Then you need dozens of people: reporters, planning editors, story editors, show directors, engineers, and segment producers, in addition to the managers and digital teams. Unfortunately, public radio developed its own nomenclature, one that’s different from film or TV or even European radio terms. In the world I come from, a producer is someone who works with tape, whether recorded in the studio or in the field. They “edit” tape, but they are not editors (I’ll get to that in a minute). They may run recording sessions, but they are not engineers or technical directors. They don’t assign stories or work with freelancers. But in podcasting, especially among folks without a radio background, the term “producer” has inflated to cover all those roles in some shops. Here’s the essential problem, though: Audio production is very time-consuming. I don’t mean because we are divas at a makeup table — I mean it literally consumes time. When you have a chunk of raw tape from the field, you really should listen to it all or you’ll miss some half-second of magic. When you edit down a section of an interview, you have to listen to that section to hear if it works. When you edit out a breath, you have to listen to make sure that person doesn’t sound like they’re trapped in an airless vacuum. When you add musical scoring, you have to listen to how that affects a section, and then keep adjusting. When you finish an episode, you have to listen to the whole thing for errors, and before you know it, you’ve started tearing it all up again. And to make matters worse, this level of over-exposure means your brain can’t hear the actual content in a fresh way. You have no idea if it even makes sense after a while because you are so busy moving Lego-chunks of audio around. Afterward you are dead, and you’re not really up for planning the next episode. That’s why it’s really important that audio producers have someone outside of this vortex to help them plan, to strategize and talk about the story so they don’t go down wrong paths that waste so much time. This is the story editor, and this cannot be the same person as the producer for the reasons I just explained above. The editor is a bridge between the producer and the listener, and the overall editorial goals of a show, production house, or newsroom. This is someone who can hear problems and give precise, actionable feedback that saves time (and lives, I like to think). Finally, when you get to issues of audio quality, levels, gear, studio management, and sound design, you need a dedicated engineer. All these people make so much difference for producer sanity and the listener’s experience, but we almost never hear their voices. Quah: Any final notes for media organizations building out audio teams for the first time? Barton: That audio production is complicated and time-consuming, but you will be rewarded by listeners for giving it the resources it needs. Anyone building a new team needs to sit in on the weekly production cycle of a show they admire. Every person involved in that production is there for an important reason. They’re actually the reason you love that show, so figure out what they do and how you can get people like them. By the way, they don’t all have to work in the same room. Some of the best productions teams I’ve been on have been scattered around the country or world. I reached out to the Post in a bid to discuss the position, and perhaps to understand the team that they are planning to build. I wasn’t given a response on the record. Anyway, I’d like to emphasize, at this point, that this story is purely about on Barton’s thinking and the larger issue of effectively translating the complexity of these jobs. This isn’t — and shouldn’t be — a story about The Washington Post’s audio team or the appropriateness of how they’re hiring for the position, as all of that very much remains to be seen. That said, it’s worth contextualizing Barton’s arguments and the Post’s situation within a dynamic that we’ve seen in other parts of the media industry — namely, that there will always exist a fine line between working to create new workflows within constraints and appropriate work-to-compensation ratios, and within this, there will always be a tension between efforts to create new pathways from the bottom up and negotiating the sanctity of traditional workflows. In related news, the Post just released its latest podcast: the Trump-focused Can He Do That? This morning, DGital Media announced yet another partner: The Players’ Tribune, which is that media platform for professional athletes. American Public Media has hired Nathan Tobey as its new director of on-demand and national cultural programming. Tobey most previously worked on podcast projects for WGBH, and was a co-creator of Strangler, which was a collaboration between Midroll Media and Northern Light Productions. Audible’s collaboration with TED, “Sincerely, X,” will come out on February 1. I wrote about the project back in September. As always, you can check out a running list of upcoming releases on this page. This shortened version of Hot Pod has been adapted for Nieman Lab, where it appears each Tuesday. You can subscribe to the full newsletter here. You can also support Hot Pod by becoming a member, which gets you more news, deeper analysis, and exclusive interviews; more information on the website. POSTED Jan. 24, 2017, 10:32 a.m.
Quah, Nicholas. "Hot Pod: What does an audio producer actually do, anyway?." Nieman Journalism Lab. Nieman Foundation for Journalism at Harvard, 24 Jan. 2017. Web. 23 Apr. 2019. Quah, Nicholas. "Hot Pod: What does an audio producer actually do, anyway?." Nieman Journalism Lab. Last modified January 24, 2017. Accessed April 23, 2019. https://www.niemanlab.org/2017/01/hot-pod-what-does-an-audio-producer-actually-do-anyway/. | title = Hot Pod: What does an audio producer actually do, anyway?